Our VP Kate and her family, Patrick and Luca, recently left Costa Rica for Washington, DC, a city that Kate has described many times as one of her favorite places to live. All of us who have enjoyed Patrick’s hospitality and culinary skills; who have walked, talked, birded and banded with Kate, and who have played with “Luca-paduca” will miss them terribly. But naturally we saw them off with a terrific Farewell Party at Las Cascatas and we wish them all the best the world has to offer! This photo was taken on June 16 at the Wilson Botanical Garden to commemorate what will now be known as “Kate’s Last Wilson Walk”. 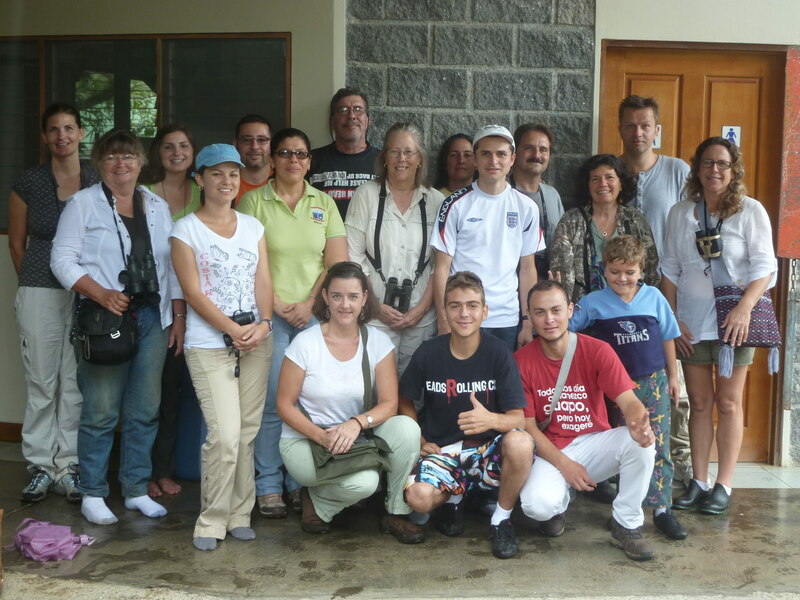 Standing from left to right are Liz Allen, Barbara Keeler-Barton, Peace Corps Volunteer Darien Combs, Elena Murillo, Heysen Esquivel, Hellen Castillo, Wally Barton, Alison Olivieri, Judith Ippolito, Erick Ilama Loria, Joe Ippolito, Roni Chernin, Mark (who is taking over Morphose Mountain Retreat B&B) and Wendy Schulz. Kneeling in front are (from left to right) Kate Allen Desvenain, Edwin Borbon Abarca, Yoiner and Royce Schulz (really not kneeling). Special thanks to visitor Landon Daft for taking this picture. This entry was posted in Viewpoints and tagged Morphose Mountain Retreat, Wilson Botanical Garden by AWOlivieri. Bookmark the permalink.